Published: Nov. 6, 2016 at 10:24 p.m. Updated: Nov. 7, 2016 at 06:57 p.m. Opportunity is the name of the game in fantasy football. Talent matters, of course, but we want players who see a healthy volume of targets and touches to anchor our lineups, especially in daily fantasy. Every week in the second season of the Opportunity Report, we'll look at all the passing targets for every NFL team and the percentage each player owns. Franchise will handle the backfield touches section this year and his Week 9 piece is tabbed above. With Jacob Tamme out for this game, Austin Hooper played on 75 percent of the team snaps. If Tamme continues to miss time, or if the Falcons just decide to keep rolling their rookie out there, Hooper could buck the trend of rookie tight ends not contributing. Hooper hauled in a red-zone touchdown on Thursday night, and Tamme came into Week 9 leading the NFL in targets inside the 20-yard line. There's clearly a role to carve out here, and the talented Hooper has a chance to sustain this momentum. Steve Smith returned to a full workload right away, leading the team in targets and playing 81 percent of the snaps. Dennis Pitta also played on 81 percent of the snaps but only saw three targets go his way. Both running backs were also involved in the passing game in this contest. These Ravens v. Steelers games almost always result in slow-paced, low-scoring slugfests. It's hard to know how much credence we should give the results in this game. The Panthers passing distribution is one of the most predictable in the NFL. 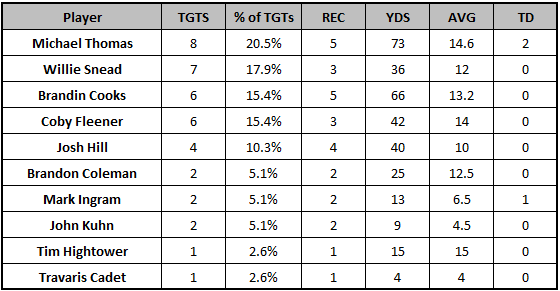 Kelvin Benjamin and Greg Olsen are going to split the target lead role more often than not. This was not a particularly effective passing game for the Panthers with Cam Newton under duress on a number of snaps, so neither of the top pass-catchers truly accessed their ceilings. Benjamin, however, has developed something of a strong floor. Week 9 was the fourth-straight game in which Benjamin has hit at least 70 receiving yards. This was only the third game in which Ted Ginn saw seven or more targets, and he has not eclipsed 60 yards since Week 3. Corey Coleman returned to full-action right away, playing on 91 percent of the team's snaps. 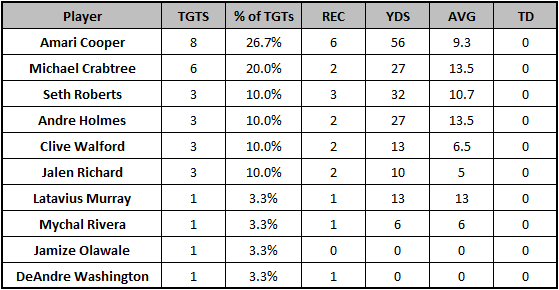 That trailed Terrelle Pryor by just one total play, and the two saw an identical share of the team targets. The explosive rookie will be a bigger factor in coming weeks when the the Browns play teams that don't limit the opposition's time of possession quite like Dallas does. Cleveland only ran 44 offensive plays on Sunday. Cleveland gets Baltimore on Thursday night, and if Terrelle Pryor draws shadow coverage from Jimmy Smith, Coleman will be in great position to produce. A week after seeing 14 targets go his way, Dez Bryant handled just 14.3 percent of the team targets in Week 9 and caught just one of them for 19 yards. There were certainly a few targets where Bryant could have done more to make a play, including a misplay in the end zone. Dallas has never been the type of offense to funnel all the action through Bryant, and there's even less reason to do so this year. Dak Prescott has shown no willingness to force the issue downfield when it's not there, and is quite content to make it work with players like Jason Witten and Cole Beasley underneath. Bryant will have his big days, but sorry about your luck, you're going to have to take some of these weeks too. Denver continues to have a strictly defined passing game distribution. 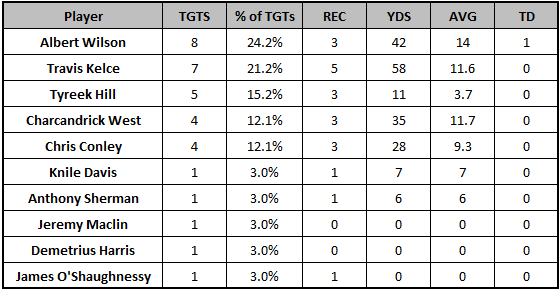 Jordan Norwood did creep in and handle four targets, but that's well outside of the norm. In this offense, we are only ever interested in the top two wide receivers, especially with Trevor Siemian's play starting to turn back into a pumpkin. Marvin Jones was once again marginalized in the Lions' Week 9 win over the Vikings. After starting the year on fire, including a 205-yard game in Week 3, Jones has 253 receiving yards since. Jones will still have productive games, but he's also showing that he can't necessarily defeat top-tier corners or added defensive attention like a true No. 1 receiver. The most valuable pass-catcher on this team might be Eric Ebron. Playing 81 percent of the team's snaps, Ebron posted another strong line. Ebron has 18 targets and 14 catches in his two games since returning from an injury absence. With Randall Cobb only playing 21 snaps after being a surprise late "active," Jordy Nelson once again chipped in at the slot position, accumulating 36 percent of his yardage there. This undoubtably helped him get free for his second-straight 90-plus yard receiving day. However, per Next Gen Stats, Sunday brought us an improved Jordy Nelson as he averaged 3.2 yards of separation at target, which was his highest figure of the season. The Packers once again lived in the four and five wide receiver set, doling out those formations on 56.9 percent of their plays on Sunday. The issue with Green Bay is that they reverted back to their old ways trying too hard to push the ball down the field, after having a ton of success with a quick-strike short passing game in their previous two outings. Rodgers went 1-of-9 on passes of 20-plus air yards. Rodgers also had the second-worst air yards differential among Week 9 quarterbacks with a -6.2 mark (12.5 intended air yards/attempt, 6.3 completed air yards/attempt). The Packers need to understand what their identity is right now, and stick to it. Donte Moncrief led the team in wide receiver snaps with 97 percent. His production will only go up as he continues to establish himself as the top touchdown threat on the team. Dwayne Allen returned from a multi-week absence, but still trailed Jack Doyle in snaps, 65 to 73 percent. It appears that Doyle has earned the job of Andrew Luck's top tight end, which is a money role. Allen's return did have a negative effect on the already unproductive Phillip Dorsett. The 2015 first-rounder dipped down to playing only 62 percent of the snaps. 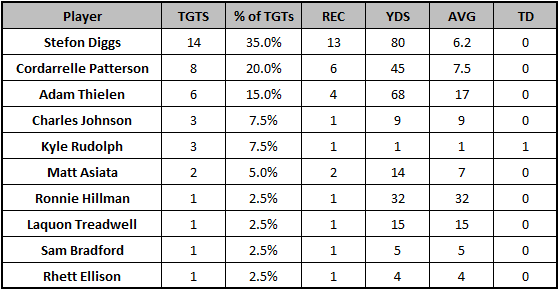 Allen Robinson continues to keep his floor afloat by seeing a tremendous share of the team targets. However, he can't access the ceiling he showed last season with Blake Bortles continuing to play unspeakably bad, so we just need to adjust expectations going forward. The rest of the offense didn't offer much, either, outside of a rare downfield target for the much improved Marqise Lee. Julius Thomas played on just 55 percent of the snaps, his second-lowest total of the season. Any loss of playing time is a killer to any predictable value Thomas may have had left. Jeremy Maclin came into this game highly questionable and left the contest after just two plays. He never returned. With Maclin down it was Albert Wilson, not Tyreek Hill who emerged as the injury replacement. He played 70 percent of the snaps, trailing only Chris Conley's 88 percent, and led the team in targets. If Maclin is forced to miss any time, Wilson would come into focus as a sleeper play against the Panthers next week. The Rams tried their best to attack the Panthers with the tight end, and outside of a ghastly miss at the goal line, Lance Kendricks helped the team on Sunday. Tyler Higbee had a forgettable outing, trailing Kendricks (81 percent) by playing only 45 percent of the snaps and hauling in just one of his seven targets. Kenny Britt and Brian Quick continue to lead the wide receivers in opportunities. Case Keenum missed Quick on a wide open deep shot and in the end zone. He's still a big-play dart throw for desperate fantasy players. Tavon Austin's two targets were a season-low and he only played one more snap than Quick. It's gone a bit under-discussed, but the emergence of Jay Ajayi and a foundation running game has had (and will continue to have) a negative effect on the statistical output of the Miami receivers. The Dolphins handed off to their running backs 29 times compared to 28 pass attempts from Ryan Tannehill. DeVante Parker was already barely a factor, and he saw only four targets despite playing 90 percent of the team snaps with Kenny Stills leaving early with an injury. The biggest loser is Jarvis Landry, who the team will no longer need to use as an extension of the running game as often as they have in the past. Landry has not seen double-digit targets go his way since September ended, after starting off with four straight games with 10 or more targets. Stefon Diggs has one of the safest floors in the NFL when he's 100 percent healthy. He just dominates the target share in the Vikings offense, and saw a whopping 14 targets on Sunday. Diggs averaged 11.8 targets in the four games where he was not on the injury report heading into the game. While Diggs might not have the same ceiling he showed in the first two weeks thanks to a broken offensive line and new scaled-back approach, he has a predictable floor to lean on. Cordarrelle Patterson continues to play as the No. 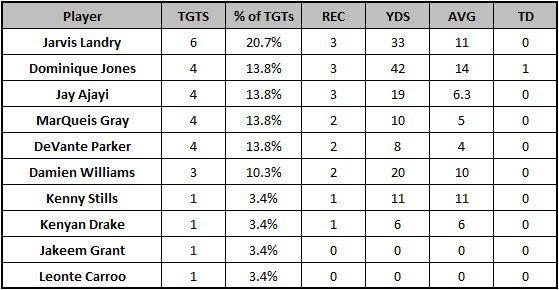 2 receiver, going out on 58 percent of the offensive snaps. He could have had a touchdown on the day, but saw it clank off his hands in the end zone. Michael Thomas is quite clearly the No. 1 receiver in this offense. Not only did Thomas lead the team in targets, he played 83 percent of the team snaps, which was way ahead of Brandin Cooks' 65 percent and Willie Snead's 59 percent. He also showed more downfield ability than he had in previous weeks, including hauling in a long touchdown pass. Thomas' average depth of target in Week 9 (12.1) was well above his season average of 8.1. Elsewhere, Coby Fleener was once again marginalized in favor of superior blocker Josh Hill. Fleener played just 32 percent of the snaps whereas Hill played 76 percent. It's going to be tough for Fleener to ever see double-digit targets with that kind of snap share. The Giants ran out three receivers on all but three of their offensive plays on Sunday. With Victor Cruz suffering an injury in this game, undrafted free agent Roger Lewis stepped up to play 57 percent of the offensive snaps. He caught one of his two passes for a 30-yard touchdown on a terrific route. If Cruz misses an extended stretch, Lewis could push him for playing time. Cruz has not scored since Week 1 or crossed 60 receiving yards since Week 3. The rocky quarterback play in New York is without question affecting the value of their pass-catchers. Brandon Marshall hasn't had a reliable ceiling or floor in weeks, while Quincy Enunwa completely disappeared after a solid outing in Week 8. He played fewer snaps than Robby Anderson, 74 to 94 percent respectively. We expected the Raiders receivers to be slowed a bit in this game, and that did indeed come to pass. Bradley Roby gave up five catches for 54 yards to Amari Cooper on 17 pass plays, while Michael Crabtree was only able to manage two catches against Chris Harris on 15 pass plays. With the distribution of targets the same as ever, there's no reason to change projections on these players going forward. Carson Wentz threw a career-high 47 passes in the Eagles' losing effort against the Giants, so the distribution was a bit more spread out than usual. Jordan Matthews led the way with 10 targets but just a 21.3 percent share. Catching zero of his five targets is no way for Dorial Green-Beckham to earn more playing time. Ben Roethlisberger continued his trend of playing below expectations in his first (usually hasty) game back from injury. Volume was able to keep Antonio Brown afloat. Eli Rogers handled a surprising 10 targets and went over 100 yards receiving. He out-snapped Sammie Coates 69 to 63 percent. Coates committed a brutal drop in the end zone, which he's wont to do every now and again. Coates will come back into focus as a fantasy asset next week when Roethlisberger should be close to full health and the Steelers will be at home. Travis Benjamin was, predictably, used quite sparingly while playing through a PCL injury. He played a season-low seven snaps and was targeted just once. With Hunter Henry also on the shelf, Antonio Gates played a whopping 81 percent of the snaps and led the team with three red zone targets. Coming second in red zone looks (tied with Melvin Gordon) was Tyrell Williams. The breakout receiver is an ideal fit for the type of slants and crossers that the Chargers love to run. Quinton Patton turned in a surprise dynamic performance against the Saints in Week 9. His stats weren't a lie either, as according to Next Gen Stats, Patton's 4.5 average separation at target led all wide receivers on Sunday. We know better than to spend much time chasing 49ers receivers, and the same goes for Vance McDonald. On the season, 61.9 percent of McDonald's 226 yards have come on two long touchdown scampers. Mike Evans continues to absorb an outrageous amount of volume every single week. After handling 17 targets and absorbing a huge hit on a dynamic one-handed sideline catch, Evans looked legitimately gassed from the usage by the end of the contest. With Russell Shepard showing up on the inactives list, Adam Humphries took a full complement of snaps, going out on 93 percent. Cameron Brate snagged a red-zone touchdown, which he's a threat for every week, and played 68 percent of the snaps in a pass-heavy game script. On the Fantasy LIVE Podcast, Alex Gelhar noted that identifying when Tampa Bay should be in those pass-heavy contests, as it will keep the blocking-deficient Brate on the field. The good news is that with their defense, those games shouldn't be too hard to come by. Over the last five weeks no player has more touchdowns than Rishard Matthews. He's only hit 70 yards receiving in just one of those games, but has five scores to show for himself. All five of those have come in the red zone, where Matthews trails only DeMarco Murray in targets seven to five. Matthews' 100 percent conversion rate inside the 20-yard line is just screaming for some regression, but his playing time is now up to leading the team in wide receiver snaps with 89 percent on Sunday. With Marcus Mariota playing so well, and Matthews' opportunities seemingly on the upswing, this could be a turning point in the season for him. Let NFL.com experts make building your fantasy lineup simple with touches and targets. Just like FedEx makes e-commerce simple for small businesses.